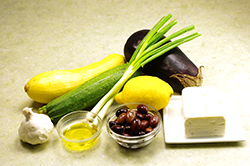 As a tapas- or meze-style appetizer with grilled bread or as a side dish, this dish makes the most of two vegetables that can be bland if cooked another way. 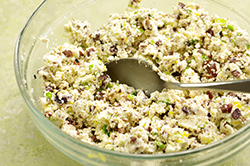 Before you go out to the grill, make the filling. If you like, add a dipping sauce of your favorite garlicky vinaigrette. All you need with this is a loaf of good, crusty bread. Yum! Prepare a hot fire in your grill. 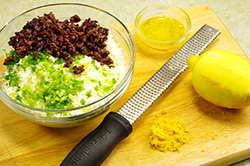 Combine the filling ingredients in a bowl until well blended. Set aside. 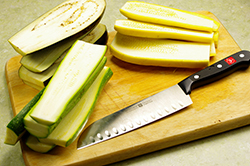 Brush the eggplant, zucchini, and yellow summer squash slices with olive oil and season with salt and pepper to taste. 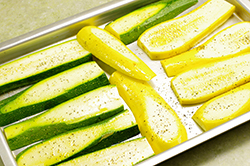 Place on a baking sheet to transfer to the grill. 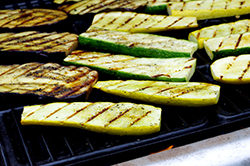 Grill the vegetable slices for 3 to 4 minutes on one side, or until they have good grill marks. 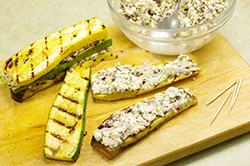 While the slices are still warm from the grill, spread each eggplant slice with some of the feta filling, top with a yellow squash slice, spread with more filling, then top with a zucchini slice to create a stack. 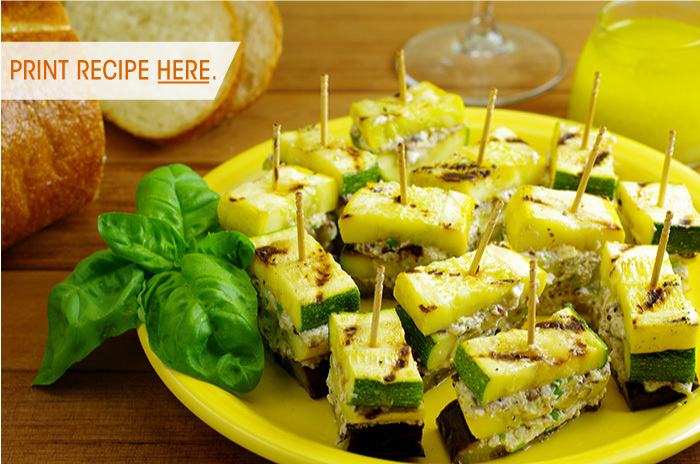 Cut each stack into 1-inch pieces, spear with a toothpick, and arrange on a platter. Serve warm or at room temperature. Recipes from The Gardener and the Grill by Karen Adler & Judith Fertig. Copyright 2011. Published by Running Press Book Publishers, Philadelphia, PA. Reprinted with permission of the publisher. All rights reserved.